When I lived in New York City, I rarely made it home for Easter. We weren't necessarily a religious family, so Easters were reserved for chocolate bunnies and egg hunts for the kids, and a chance for the family to get together and feast on good home cooking. When I couldn't make it home for the holiday, my friends and I would end up in Chinatown for Dim Sum. In fact, my friends and I reserved many Sundays for Dim Sum. I'm not necessarily a big fan of dim sum dishes, but it became a sort of ritual we indulged in as the food was always cheap, and there was nothing more entertaining than sitting around a big round table daring one another to try some of the more exotic dishes that came by on rolling carts. I rarely had room for sweets afterwards, but one of the more popular desserts on offer were tiny egg custard tarts. Egg custard tarts are popular in many parts of the world, particularly in Chinese and Western European cuisines. Custard tarts were introduced in Hong Kong in the 1940's by "Cha Chaan Tengs" or "tea restaurants" which is a Hong Kong version of grassroots American diner. Custard tarts were then introduced in western cafes and bakeries to compete with dim sum restaurants, or yum cha. Yum cha literally means "drink tea" and describes the dining experience of drinking Chinese tea and eating dim sum dishes. 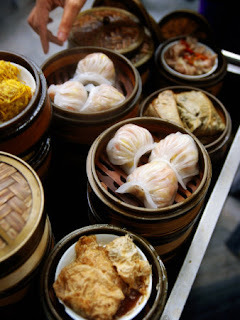 Dim sum is a varied range of small dishes, not unlike tapas, eaten for breakfast, brunch or afternoon tea. Mini egg tarts are now a common dim sum dish. Hong Kong egg tarts are typically encased in shortcrust pastry or puff pastry, and traditionally use lard rather than butter or shortening. This is just one of many variations of the recipe. Preheat the oven to 325° F. Grease the tart pans. Cut the lard. Use a sifter to sift the flour into a large bowl. Work the lard and butter into the flour with the tips of your fingers, until the mixture has the appearance of coarse breadcrumbs. Continue kneading, adding the hot water. Roll the dough into a large ball, cover with wax paper and refrigerate while preparing the custard filling. Lightly beat the eggs, taking care not to produce any air bubbles. Stir in the milk and the sugar. Add the yellow food coloring if using. On a large, lightly floured surface, roll out the dough until it is very thin (about 1/8-inch thick). Cut the dough in half before rolling out if needed. Use a pastry cutter to cut out 18 circles that are 3-inches in diameter. Fit the circles into the tart shells. Pour the filling into the shells. Bake until the custard is cooked and a knife inserted in the middle comes out clean (about 35 minutes). Cool.